“I have been fortunate enough to participate in all but two of the NEFFA Festivals. I missed the first because I hadn’t started dancing yet, and I was away in the army in 1955. On November 18th, 1995, NEFFA, and indeed the world of dancing, lost a dear friend. Almost from the start, Ted was associated with NEFFA and supported its objectives in many ways. Festival Orchestra Salute to Ted Sannella – A multi-caller program with brief remarks by the callers and Janet Breslau, one of Ted’s daughters. Ted’s “Merry Go Round” – Called by Tony Saletan, Dan Pearl, and Tony Parkes. Ted Sannella of Wiscasset, Maine, a former pharmacist at Richardson Drug in Concord and a choreographer whose forte was traditional dancing, died at his home Saturday after a long battle with cancer. He was 67. Mr. Sannella was born and raised in Revere [Massachusetts]. He graduated from Revere High School in 1945 and Tufts in 1949, receiving degrees in biology and chemistry. He worked as a pharmacist for 35 years before retiring in 1989 and moving to Maine. 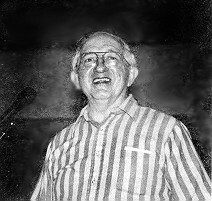 Mr. Sannella devoted much of his time to traditional New England dancing as a caller, choreographer and dancer and was known among is peers at the ‘dean of New England callers.’ He began calling professionally in 1946 and organized dance series in Cambridge, Westport, Concord [Mass.] and North Whitefield, Maine. He was the past president of the New England Folk Festival Association and the North of Boston Callers’ Association. He was an Honorary Life Member of the Boston Centre of the Country Dance Society and honorary member of the Country Dance and Song Society. Mr. Sannella also served on the Board of Directors of the New England Folk Festival Association, the Folk Arts Center of New England and the National Council of the Country Dance and Song Society. He wrote three books on the subject and called dances in five foreign countries. He leaves his wife, Jean (Davis); two daughters, Marianne Tibbetts of Windsor, Maine, and Janet Breslau of Jamaica Plain; two sons, Donald Sannella of Edinburgh, and Michael Sannella of Morristown, N.J.; a sister, Anna Mayo of Concord; a brother, Joseph Sannella of Muncie, Ind; and five grandchildren.